The villa is just a few steps from the beautiful unspoilt beach Plum Bay. 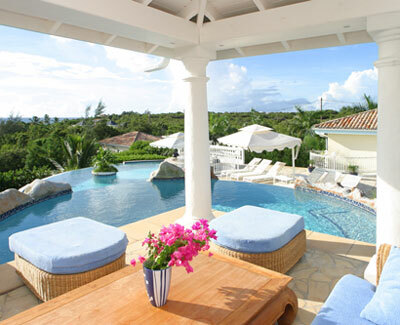 Overlooking Plum Bay this 6 bedroom, 7 1/2 bath villa has a beautiful cascading pool and spacious 2 level terrace perfect for outdoor entertaining. The large living area has a wet bar, TV viewing area with satellite and VCR and dining area extending out to the terrace for gorgeous sunset views over the Caribbean. There is a fully equipped modern kitchen and a gas grill for barbecuing on the terrace. Of the 6 spacious bedrooms there are 4 king size and 2 twins, all have baths and / or showers and all are air-conditioned. For the "sportif" the villa also has a large room on the lower floor with gym and games facilities with weights, step machine, bike, pool table and table tennis. It is also equipped with a TV and bathroom with shower . For outdoor sports there is also a private tennis court. The villa is just a few steps from the beautiful unspoilt beach Plum Bay.